Stretching for a mile along the southeast coastline of Virgin Gorda are several isolated beaches sheltered by massive boulders, forming many caves and rock pools. One of these beaches is the world famous Baths National Park, commonly known just as The Baths, established in 1990 and covering an area of seven beachfront acres. A collection of massive granite boulders—some as large as 40 feet in diameter—dot the white sand beaches and create magical secret rock pools. This popular daytime anchorage is ideal for swimming and snorkeling. The dinghy dock offshore prevents the beach from becoming overcrowded, while mooring buoys protect the reef from anchor damage. Swim line markers guide vessels through safe channels when approaching the beaches, but caution should always been used and speeds should not exceed 5 mph. Strong ocean swells often occur during the winter months, preventing the use of the mooring buoys and access to the beach from the sea. Swimming is also discouraged during these periods, due to the strong currents. Access to The Baths is secured at the top. A series of steps and rope handrails guide explorers along a trail through the boulders from the beach at The Baths to the sandy expanse that is Devil’s Bay. Another popular beach for residents and visitors is Spring Bay which is accessed from Tower Road and connected through an intricate trail dissect. 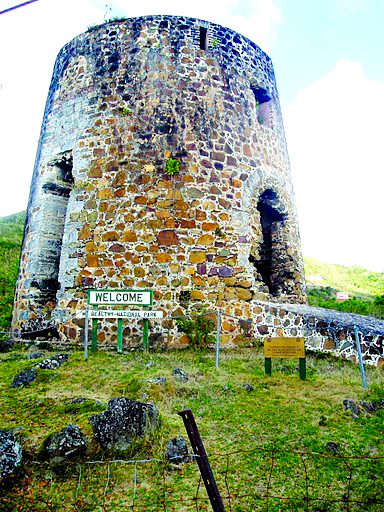 Established in 2003, Copper Mine Point covers an area of just over 18 acres on Mine Hill, situated on the cliffs of the south eastern tip of Virgin Gorda. The park is comprised mainly of the ruins of an 18th century mine, whose chimney stack dominates the landscape. Although the Spaniards were the first Europeans to mine copper here in the early 18th century, it was actually Cornish miners in the 1800s who built the mine, the ruins of which we see today. As many as 130 Cornish labourers and their families lived on Virgin Gorda during this time. The ruins of their housing area and the operations center, containing the powerhouse, mine shafts, cistern, engine house and chimney, are still visible fi xtures scattered across the slopes. Well before the Cornish and Spanish miners arrived, Amerindians mined the area for copper to make tools and jewelry. Mine Hill is a habitat for the white-tailed tropicbirds (Phaeton Lepturus) that nest in the rocky cliff crevices by the sea close to the southeastern corner of the Cornish Engine House. Departing from their seaside nests, they dive from incredible heights in order to feed on marine species, such as squid. Established in 1979, the Botanic Gardens cover an area of 2.87 acres and is located on the site of the century-old Agricultural Experiment Station. The park’s name honors Joseph Reynold O’Neal, a leading fi gure in the establishment of national parks in the territory. 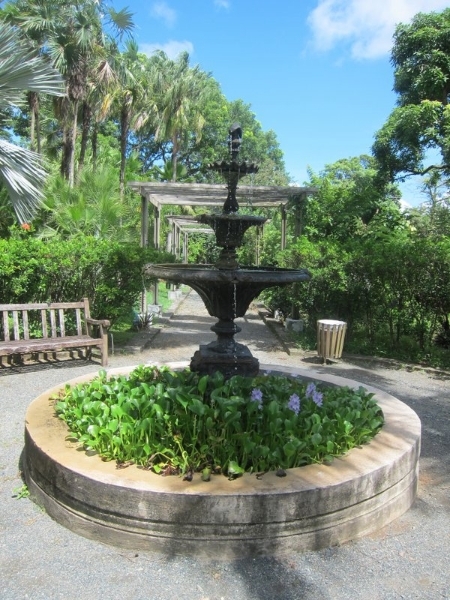 The gardens represent an oasis in Road Town with its avenue of royal palms, leading to a fountain and providing a captivating entrance for visitors. The botanic collections represent the different habitats of the BVI, such as the rainforest, coastal environments, dry forests, in addition to displays of exotic species, and an extensive collection of palms. The gazebo of orchids, both native and exotic, can be discovered by the pond, which is fi lled with fi sh, tortoises and lilies. The nursery at the gardens cultivates a wide variety of horticultural species to refurbish the beds and for resale. It has recently become an important repository for several endangered species of fl ora found within the BVI, such as the Acacia Anegardensis, among others. Established in 1983, this park occupies one acre of land. 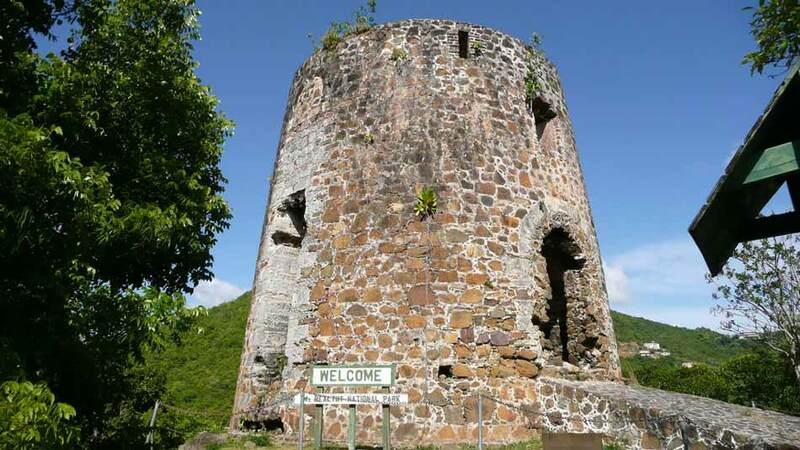 Its central attraction is an 18th century windmill which was used for grinding sugarcane farmed from the steep slopes on the north shore of Tortola. Once part of a thriving plantation, it is now a peaceful setting for picnics and a rest stop for visitors. 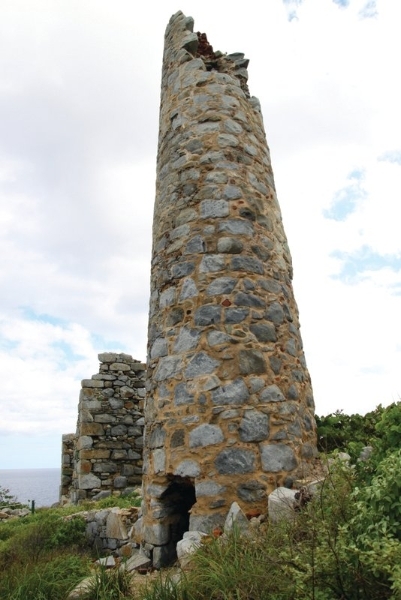 The windmill at Mount Healthy, which was constructed from fileld rubble, is the last remaining windmill found in the BVI. Its large arched apertures are accented by cut stone blocks, and were functional openings used for carrying the sugar cane into the mill for grinding and the crushed cane (bagasse) out. This park is well worth a visit if you are interested in the vibrant history of these islands. 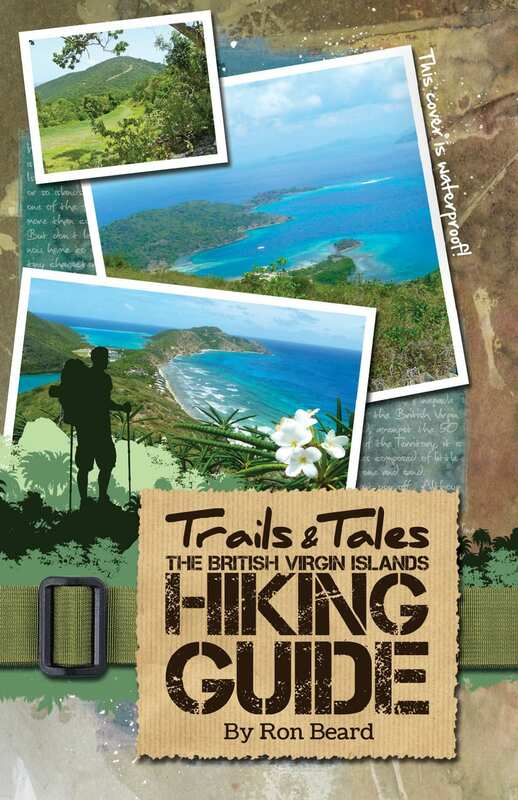 It can be reached along the road which leads from Ridge Road down to Brewers Bay, on Tortola’s north shore. Established in 1964 and covering an area of 86 acres, Sage Mountain was effectively the territory’s fi rst national park. The park’s creation represents the beginning of the conservation movement here. The land was purchased with donations from Lawrence Rockefeller and was gifted to the government. Reforested with white cedar (Tabebuia Heterophylla), West Indian (Swietenia Mahogoni) and Honduran (Swietania Macrophylla) mahogany trees, which now thrive along with other naturally regenerated secondary vegetation; the northwestern side of the park is representative of a Caribbean rain forest. Sage Mountain is the highest point in the Virgin Islands, rising to 1,716 feet at the northwestern side of the park, with panoramic views of all the islands. The main entrance to the park is a 5-minute walk from the car park atop the hill; there are twelve trails through the forest with loops creating a circular route. Brochures are available at the entrance, accessible by vehicle from the top of Windy Hill.